Choosing the right Chiropractor is an important choice to make. Dr. Baffes and Dr. Cummins and their staff are trained on the latest chiropractic treatments & technologies. 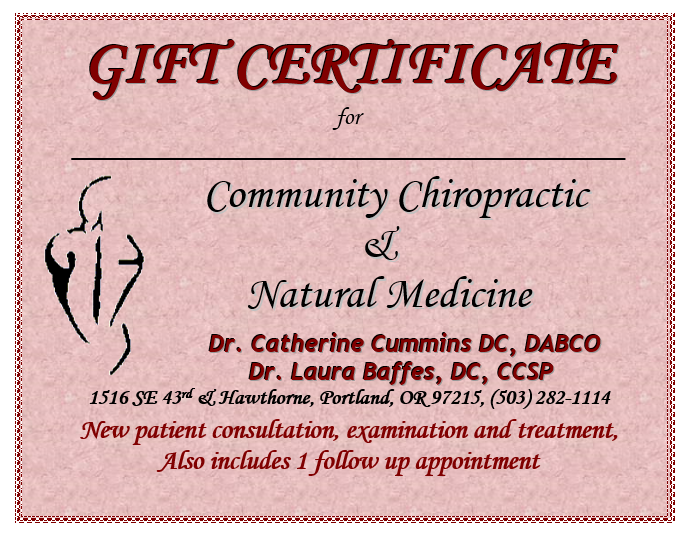 Thank you for visiting the website of Dr. Laura Baffes, CCSP, Dr. Catherine Cummins, DABCO and Community Chiropractic & Natural Medicine - a professional Portland Oregon chiropractic clinic. In practice as well as online, Dr. Cummins and Dr. Baffes strive for excellence through superior patient treatment, education and satisfaction. Our goal is to provide comprehensive natural healthcare in a comfortable, relaxed and healthy environment. We want to help you live a healthier, happier and more pain-free life. In the Health On Hawthorne building Community Chiropractic and Natural Medicine offers Chiropractic, Acupuncture, Naturopathy and Massage Therapy services. Please feel free to call if you have questions about any of these services. Living a healthy lifestyle and keeping your body functioning at it's optimum level can increase the quality and length of your life. This is our ultimate goal at Community Chiropractic & Natural Medicine at the Health on Hawthorne Center. We specialize in musculoskeletal pain syndromes such as neck and back pain, sports injuries, work and auto injuries, TMD (jaw) pain, neck and low back disc herniations, sciatica, as well as, pediatric and neurological conditions, and frequency specific microcurrent, and nutritional therapies. We offer acupuncture, massage, chiropractic, and natural medicine options for you and your families. Dr. Cummins is a diplomate in Orthopedics and past President of the American Board of Chiropractic Orthopedists. She also practiced as a Certified Sports and Conditioning Specialist (CSCS) specialty trainer for Olympic athletes, martial artists and competitive curlers for many years. Dr. Cummins has a particular passion for peak athletic performance and fall prevention testing and training. Dr. Baffes is a Certified Chiropractic Sports Physician and also has a focus on neurology and pediatrics. Dr. Baffes & Dr. Cummins have both been professors at University of Western States for over 25 years and teach doctors continuing education classes internationally. They are involved in research, editing and publishing articles and book chapters on many topics in chiropractic. They also serve as expert witness in legal cases and are available to consult as independent medical examiners. Dr. Cummins and Dr. Baffes are available for consultations and second opinions for patients and physicians in their areas of specialty including auto and work injuries, the tempormandibular joint, head & neck injuries, sinusitis and ear infections, neurological problems and geriatrics and pediatrics. We would be pleased to work with you and your other healthcare providers to assist you on you path to better health. We offer care to relieve pain, rehabilitate the injured areas and improve function. We accept most health insurance plans and are preferred providers on many plans. Within this site you will find over 1,000 pages of all types of health-related information. Information about our office and services, chiropractic, diet and nutrition, back and neck pain, work and auto injuries, a monthly health newsletter and much, much more. Please free to contact us if you have any questions. Our phone number and email is available at the top of the page. We hope you enjoy the information and share it with others. Again, thank you for visiting and please come back often. In the Health on Hawthorne building Community Chiropractic and Natural Medicine offers Chiropractic, Acupuncture, Naturopathy and Massage Therapy services.